Ignore the cooking competitions on television when you can see chefs up close and personal, put to the test with ingredients and time restraints at the 5th annual Mason Dixon Master Chef tournament being hosted at the Inn at the Colonnade Baltimore. Sixteen regional chefs cook, similar to March Madness bracketed competitions, starting Monday, June 15th and ending Sunday, August 16th with the last two chefs standing doing head-on culinary battle for the 2015 title. A full schedule as well as chef bios are available at http://www.masondixonmasterchef.com/schedule-results/bracket.php. Sean Praglowski, Power Plant Live! 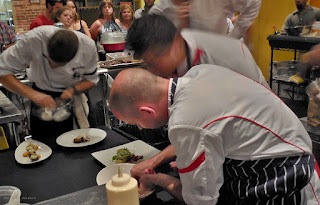 Guests are invited to be part of the excitement; tickets for all 15 dates of this summer-long single-elimination chef competition are available for purchase at: http://www.masondixonmasterchef.com. Tickets for most matches are $25 for general admission and $45 for judging experience (including all taxes). In addition, the Mason Dixon Master Chef Tournament donates 10% of the net proceeds of each ticket sold directly to their charity partner Meals on Wheels of Central Maryland (http://www.mealsonwheelsmd.org). This multi-week event is a single-elimination tournament designed to showcase some of the area's finest executive chefs and restaurants. Guests attending this exciting event will be more than just spectators, as they enjoy the unique experience of witnessing two spectacular area chefs battle it out in the prep kitchen right on the main floor. Each evening, two chef teams go head-to-head to prepare an appetizer, entrée and dessert for each of three expert judges, as well as amuse bouche portions of their entrees for up to 30 audience member judges. Their creations are scored on creativity, presentation and taste, and only one chef advances to the next round. At the end of this tournament only one of the 16 competing chefs will emerge as THE Mason Dixon Master Chef! 10% of the net proceeds of each ticket sold directly to Meals on Wheels of Central Maryland. More information available at www.MasonDixonMasterChef.com, on Twitter @MDMasterChef, and Facebook at Mason Dixon Master Chef.